Visitation with family members, relatives and friends will be conducted on the following schedule. Each inmate will be allowed one (1) visit per visitation period. Visitation will be on Fridays, Saturdays and Sundays. You will be allowed TWO (2) twenty-minute visitations per week. The current schedule will be posted in the lobby of the jail. No child will be allowed to be left unattended in the Ware County Jail. A visitor will be denied a visit if the visitor is under the influence of alcohol and/or drugs or is disruptive or refuses to follow facility rules. All visits will be supervised by a staff member. Purses, food/drinks and smoking are not allowed in the visiting area. Visitation by legal counsel, ministers and other privileged individuals will be conducted with the most privacy available and will not be limited or restricted during normal hours. However, such visitations may be suspended or delayed during scheduled facility programs and services. No contact visits are permitted. 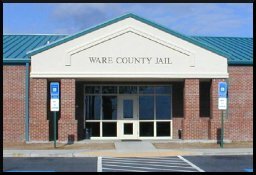 The Ware County Jail reserves the right to deny any visit. Mail is being held as evidence to substantiate any breach of Jail security. Mail is being held because it contains contraband, plans for escape, threats of bodily harm to another, plans for riot or other disorder, and/or plans for the production of any explosive, incendiary or pyrotechnic device. The phone system in the Ware County Jail is operated and maintained by ATN, Inc., of St. Marys, Georgia 31558. All questions concerning communications using the inmate phone system should be refered directly to the ATN customer service representatives at (800) 849-6081. The most common problem encountered with the Inmate Phone system is that calls can not be completed to certian phone numbers. ATN service representatives can quickly check to see if there is a block on your line, or if your calls are not being completed for some other reason. ATN, may block your line for any of the following most common reasons. The customer may be using a cell phone that is unable accept collect calls.